Coolangatta, a charming town, is located on the southern part of Australia's Gold Coast- at the Queensland and New South Wales' border. Its twin town Tweed Heads lies nearest to Coolngatta at the famous 'Point Danger'. Extremely popular with both tourists and leisure seekers, Coolangatta offers great views and has some fantastic beaches with attractive coves where you can unwind and enjoy the lovely weather. Getting around through car hire Gold Coast will make your adventure more comfortable and hassle-free. Also, tourists like to explore this popular region with our Coolangatta Car Hire, as it is affordable and provides you with a friendly option to travel and see the sights at your own pace. 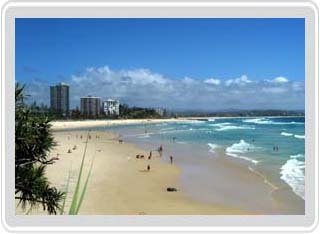 The drive along Coolangatta's patrolled beach with its excellent surfing spots is popular with many tourists that come to stay in this town. Some of Coolangatta's great surfing areas include Greenmount and Kirra. For picnic enthusiasts there is an attractive parkland nearby where you can take your family for a fun outdoor experience. If you came from Brisbane, you can hire a car rental Brisbane for your transportation needs. Choose from a wide variety of hire cars at Select Rent a Car. We can provide our customers with large people carriers, sporty soft tops, luxurious sedans, fun 4WD vehicles and economical small cars. If you enjoy shopping you can drive down to this area's fabulous shopping arcades. Coolangatta's famous Showcase Shopping Centre can be found at the Marine Parade, giving its visitors a wide range of shops, unique beachfront shopping experience, with some great restaurants and cafes warmly welcomes all visitors. If you're looking for some great bargains, simply drive down to the nearby market at Coolangatta and pick up some fantastic gifts for yourself or your family. The Market is a monthly event held along the Coolangatta Marine Parade on every second Sunday of the month. As a preferred Coolangatta car hire company, Select Rent a Car can provide tourists with a wide range of very affordable rented cars - with fully economical sedans, spacious people movers, peppy soft tops, midsized family sedans to even small compact cars on offer. The Coolangatta Car Rental offices at Select Rent a Car are open Monday to Sunday for your convenience. Call our toll free number to book your rental, with easy car pickups from main airports and our handy office locations, we make renting a car easy and convenient. Having won the trust of discerning travelers and tourists for more than two decades, we have available state-of-the-art accessories like booster seats, baby seats, satellite navigation units and UBD maps. So go ahead and enjoy the many outdoor attractions and attractions on offer with friends and family, made possible by our 'always-ready-to-help' experts and our quality and best priced vehicles. We also offer Surfers Paradise car rentals if you prefer for a sunny beach escapade. For more detailed information regarding our Coolangatta Airport Car Rental, please contact us. Coolangatta Car Hire: for the list of available cars, please use the form located in the Select Rent A Car homepage. We also recommend the use of Cutprice car rentals for your Coolangatta Car Hire needs and Suncoast Car Rentals for your Car Hire Coolangatta Airport requests.